Danielle Fuller and DeNel Rehberg Sedo. 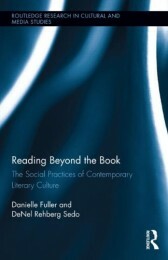 Reading Beyond the Book: The Social Practices of Contemporary Literary Culture. Routledge, 2013. 370 pp. Reading Beyond the Book presents the results of an extensive program of research into what the authors call mass reading events (MREs). It features case studies of the Richard and Judy Book Club, Canada Reads, and a variety of One Book, One Community (OBOC) programs: from Seattle Reads, which was the first program of its kind, and went on after its 1999 launch to become the basic toolkit for OBOC programs all over the world, to Get Into Reading, a grassroots program that aims to have Liverpool’s underprivileged communities reading classic literature together. The broad purpose of Reading Beyond the Book is to study the “production, promotion, circulation, and reception” of MREs, as a way of exploring “why a feeling for reading and sharing books persists in North America and the United Kingdom in a digital age” (2). Fuller and Sedo suggest early on that MREs are evidence of the way that “literary experiences” are now extended through a variety of print and nonprint media, such as films, author events, and book festivals, while publishers are eager to involve their titles in any effort that might allow content to be repurposed across media platforms. As Simone Murray’s recent book on “the adaptation industry” eloquently shows, publishers and other media companies eager to market their selected lead titles push audiences “to consume near-identical content across multiple media” (Murray 18) and to view literary reading as a cross-platform “media experience.” For Fuller and Sedo, MREs are a form of entertainment similarly well-suited to the intermedial spectacles of the twenty-first century. Participants in MRE activities can expect to be entertained while gaining knowledge and enjoyment from their engagement with a book’s story and “its extratextual aspects” (205). They can also expect not to feel pressured by any long-term commitment to a face-to-face book club, or by having even to read the book. Fuller and Sedo’s initial question, then—why does the book persist?— might seem a little strange, since they themselves go on to show that the book persists because of its very adaptability to current market conditions, because of the ways in which it has been ingeniously reimagined and repackaged. Instead of any tension, there is rather a symbiosis between the book as a form and its translation into remediated literary experiences. Indeed, where their research subjects—be they ordinary readers and MRE participants, or librarians and other cultural intermediaries involved in MRE production—continue to insist on a tension, Fuller and Sedo come to suspect that these readers’ self-conceptions lend themselves to conservative approaches to reading that preserve it as an elitist activity in the cultural hierarchy. In their account there now exists a large-scale “reading industry” committed to the manufacture of both material goods and ephemeral experiences for profit, and consisting of “the organizations, institutions, and businesses” that produce artifacts and events for the reader-consumer (16). This industry includes, importantly, not-for-profit agencies, such as public libraries and arts organizations funded either through public funding or—as is increasingly common—through combinations of private and public monies. Given how public agencies are asked now to account for every penny, measure every impact, and prove their legacy, even those players in the MRE field who are not primarily commercially motivated have to be ever conscious of the necessity of “securing funds, brokering deals with for-profit organizations, and accounting for money spent in terms of audience participation, artifacts distributed, and media visibility” (18). Fuller and Sedo’s account of how money circulates through MREs is, in its capaciousness and breadth, an unprecedented contribution to the study of the contemporary literary economy. There is a perceived ethos of social inclusion and accessibility in MREs, which often involve free public talks, book group discussions, film screenings, visual art displays, and musical performances. But these events, along with free or discounted copies of books, need to be paid for. Costs are usually subsidized by the organizing public library services, which broker deals with other agencies (local newspapers, radio stations, museums, theatres, cinemas, galleries, schools, publishers, et cetera) that can provide in-kind contributions or share in promotion costs for events. They also look for sponsors, and have found willing participants in the likes of Boeing, Target, Allstate and Motorola—companies that presumably like the prestige associated with books and the socially conscious appearance of the MRE model. Yet Fuller and Sedo show that understanding the economic determinations and consequences of MREs requires more than an account of how they are financed. Also relevant is a consideration of the political economy of the media industries, specifically MREs’ partnerships with TV and radio broadcasting companies and with transnational publishing corporations, which seek any opportunity to make titles visible (and to be clear, while there is limited evidence that MREs make new readers, they are good at making one title sell well for a while). MREs can also be seen in the context of the neoliberal displacement of the idea of culture as a public good, emphasizing how all culture can and should be commercially viable. Relatedly, on a local level, class affiliation plays a role as well in determining participation in mass reading events. Some people are motivated to participate because they are worried about social degeneration in their communities and they have the time and the means to attend to such matters; others do not participate because they think that libraries and reading are for wealthy white people. Still others, such as recent immigrants, often lack not only the economic means for participation, but also the cultural capital necessary to understand and engage with “the modes of belonging and identification” (230) that these events promote. What Fuller and Sedo want to indicate, then, is some tension in the fact that, against all this certainty of economic determination, the people involved so crucially in this “reading industry” tend to distinguish their practice from any kind of mass culture, which they continue to perceive as failing to afford the kinds of personal development, civic engagement and deep reflection that reading encourages. They hold on to their faith that reading can be “an individually transformational, educational, therapeutic, creative, and even ‘civilizing’ experience”; and they embrace “the ideal of shared reading as a way of building community and improving cross-cultural understanding in urban centers” (3). So if there is a way in which reading seems to have “shed its popular image as a serious, solitary, and academic pursuit” (14), nevertheless, for many of the cultural intermediaries and everyday readers who are the focus of Reading Beyond the Book, the aura attached to reading books has to be maintained for it to have the resonance that it does. The case studies of the Richard & Judy Book Club (RJBC) and the Canada Reads radio competition, both discussed extensively in the book, exemplify this point. The RJBC was part of the Richard & Judy Show, broadcast on the commercial Channel 4 in the UK. Modeled after Oprah Winfrey’s televised book club, the RJBC followed the familiar format of daytime TV magazine programs. It featured in-studio presentation of the book by the hosts, a discussion with guest celebrity reviewers and edited sequences featuring interviews with the authors or providing context to the book’s story. Fuller and Sedo argue that through such communication strategies, as well as in the selection of texts across a range of literary genres, the book club promoted reading “as a pleasurable and accessible activity” (58) and the show’s popular hosts were perceived by their audience more as “trusted guides” than as authorities in book reading. Fuller and Sedo identify differing views among readers—both participants and non-participants in MREs—about the cultural work that these “reading spectacles” do. Some readers point out that such programs have the benefit of making more people interested in books and reading or, in the case of Canada Reads, of informing listeners about Canadian cultural products. Others are more skeptical of literary discussions being featured as part of commercial media, especially in formats such as daytime TV or reality shows transposed to radio. Some readers view the book reading that these shows promote as a “disingenuous” attempt “to make a highbrow practice into a popular culture product” (109). In the case of Canada Reads, furthermore, many express unease about the compatibility of this popular genre of entertainment and the CBC Radio’s cultural and national mission. Respondents in Fuller and Sedo’s study, particularly those who are suspicious of the success of MREs, frame their answers within a hierarchy of cultural taste, the very hierarchy which the producers of these shows claim to work against. These participants articulate a distrust of the commercialization and popularization of books, securing in such a way a “claim to good ‘literary’ taste” (81), counterposed against the shows’ “homogenizing effect.” In this “dance of distinction,” as the authors call it, the readers attempt “to distinguish themselves against popular culture by reiterating that hierarchy even in the face of its apparent dissolution” (86). The authors argue, hence, against Jim Collins’s recent claim that popular culture has been “thoroughly destigmatized” (Collins 19). Their difference with Collins is probably one of degree, however: in Collins’s approach, literature very much retains its elite aura. He simply points out that this elite aura is an attractive property for those eager to sell niche literary experiences via Miramax films or coffee shops decorated with murals of famous authors and choice literary quotes. (For instance, “There’s no money in poetry, but then there’s no poetry in money either” — Robert Graves.) The argument of Reading Beyond the Book is a little different. The authors suggest that the assumed superiority of literary reading helps to preserve the MRE’s fundamentally conservative orientation, even as it grounds the democratizing cultural project imagined by organizations and participants. This conservativism has several facets. There is for example the easy alignment of MREs with contemporary neoliberal policy pieties, which place culture in service to the economy and to the social production of consumer-citizens (or, at best, citizen-consumers). There is the preference that MREs show for mainstream realist fiction produced by the publishing branches of transnational media corporations over, say, avant-garde poetry put out by a small press. There is the related emphasis on a work being eminently “discussable” (at the level of characterization and plot; form is largely irrelevant to MREs) and never “too difficult” (27). Selected works often confirm rather than complicate received ideas about culture, race and class, and inducing concerted political action is rarely among their goals. There is, finally, what Fuller and Sedo identify as the MRE’s perpetuation of the basic “ideology” of reading, which celebrates it as an activity that magically transcends the very commercial concerns that provide readers with their materials. Fuller and Sedo differ here from Jim Collins, who is largely sanguine about the way in which the literary has converged with other media in recent years. When Fuller and Sedo notice that some crucial players in the reading industry insist on retaining some distinction between culture and commerce (25), they are bothered by these players’ failure to achieve self-awareness. Seeing themselves as the “unfortunate scholarly products of [what Harold Bloom dubbed] the ‘New Cynicism’,” the authors adhere fiercely to the orthodox cultural studies positions: first, that reading is always a “social and political act performed by embodied individuals,” and second, that “all cultural activities have ideological effects” (41). The question that then arises for us is this: why does an adherence to this idea of reading as an embodied “social and political act” determined by current economic and political imperatives necessarily forbid faith in the transformative power of reading (or any other experience, conducive to anti-market thinking, based in the contemplation of culture)? Indeed, especially given the conditions that they outline— conditions highly favourable to mainstream literary reading experiences and averse to anything too challenging or disruptive—wouldn’t it be a good idea to hold on to those moments in any cultural phenomenon when a non-market impetus is evidently at work? If, as Nicholas Brown has recently claimed, “a plausible claim to autonomy is … the precondition for any politics at all other than the politics of acquiescence to the dictates of the market” (n.p. ), isn’t there some promise in the fact that people involved in MREs are suspicious of attempts to reduce their cultural pursuits to their market value? A similar question can be asked in relation to the potential of shared-reading programs to bring about concrete political and social change. Fuller and Sedo don’t see such potential, but they do acknowledge the ways in which the community engagement that these events offer, although apolitical, can be a source of personal empowerment for participants. Such engagement doesn’t happen in a politically active public sphere, which in the twenty-first century has been impoverished after years of privatization and cuts to cultural and social programs. Instead, MREs and the reading communities that they bring together are interpreted as potentially part of a gentler, “intimate public sphere” (borrowing Lauren Berlant’s concept) that provides some relief from the complexity of everyday life and allows for the enactment of affective notions of citizenship and belonging. It is also within this sphere that we can observe what Northrop Frye called “the principle of life imitating literature”— life experiences increasing in value “when something like a literary shape can be discerned in their chaotic phenomena” (Frye 57). MREs ensure a narrative thread from book to real life through, on the one hand, the selection of books which reflect and represent the history, geography and stories of local communities and, on the other, through the organization of such literary events as author’s readings or bus tours of the places where the book is set, which blur the line between fiction and documentary as well as between author’s and readers’ lives. For readers, participation in such events enhances their learning about their communities, while also creating an intimate connection with the authors. More importantly, it satisfies a generally felt desire to be part of something larger than one’s self, in this case an affective community of readers. Fuller and Sedo argue that, brief and ephemeral though they are, these moments of connection can give a sense of agency to the participants who otherwise might feel politically disempowered in their everyday lives. They coin the term “citizen readers” to designate this group of committed book fans for whom reading is a form of belonging that enables their coming together as a pubic and their more meaningful relationship to both a book’s text and their local environment. The term “citizen” does not refer here to an officially sanctioned form of national affiliation; it is not so much the citizen-reader idealized by the producers of the Canada Reads competition, as it is the expression of a certain nostalgic longing to connect to and cherish that which makes sense in one’s life, in both material and symbolic terms. The authors stress the apolitical and the often non-representative character of the collectivities thus created. They don’t “challenge the ruling relations of power” (213) and indeed, their demographics (white, educated, older women with the requisite economic, cultural and social capital to be able to relate to and enjoy the activities they are taking part in) sometimes leaves other groups (blacks, immigrants) feeling socially and culturally marginalized (240). The kind of social transformation that shared-reading events can be expected to achieve is at the most to improve literacy or mark the beginnings of conversations about cross-cultural and cross-racial understanding (11). But primarily, in Fuller and Sedo’s account, MRE participants seek and experience the pleasurable engagement with a world beyond the book’s page, a world largely mediated through the visual and participatory precepts of nonprint entertainment and through the economy of the media spectacle. Though Fuller and Sedo are critical of the apparent conservativism of MREs, they do sympathize with the attempt to take literary reading out of the university classroom and make it the heart of affective experiences (37). They seem to have embraced Janice Radway’s dichotomy pitting regular versus academic reading, the former being emotional, genuine, natural, heartfelt, while the latter is cold, “lifeless, abstract,” rationalized, formal, and devoid of any relevance to the average person (Radway 3). So while they present their own challenges to MREs, they also challenge those critics who fault MREs for making fiction into the pretext for therapeutic identification with “relatable” characters and for stripping literature of any formal interest or ability to take me outside of—rather than further into—myself. Brown, Nicholas. “The Work of Art in the Age of Its Real Subsumption under Capital.” March 12, 2012. http://nonsite.org/editorial/the-work-of-art-in-the-age-of-its-real-subsumption-under-capital. Collins, Jim. Bring on the Books for Everybody: How Literary Culture Became Popular Culture. Durham: Duke University Press, 2010. Fry, Northrop. Spiritus Mundi: Essays on Literature, Myth, and Society. Bloomington, IN: Indiana University Press, 1976. Murray, Simone. The Adaptation Industry: The Cultural Economy of Contemporary Literary Adaptation. London: Routledge, 2011. Radway, Janice. A Feeling for Books: The Book-of-the-Month Club, Literary Taste, and Middle-Class Desire. Chapel Hill: University of North Carolina Press, 1997. Sarah Brouillette is an associate professor in the Department of English at Carleton University, where she teaches contemporary British, Irish, and postcolonial literatures, and topics in print culture and media studies. Lina Shoumarova is a doctoral student in the Cultural Mediations program at Carleton University. Her research is concerned with the relationship between book publishing and language and with the literary production of linguistic and cultural minority communities.